I found this MULTISITES section from one of your newsletters. What is this about? A special version that allows to manage several shops in different domains form one centralized backend? Or just simply a multi-license bundle? It's simply a multi license bundle. So as a web developer does this mean we can purchase hikashop multisites for the one off price and install this on as many customer websites as we wish i.e. unlimited, without any additional cost? If that is the case and we then wanted ongoing support and upgrades after 1 year then we would have to purchase a subscription at what cost? Yes, that's exactly that. Regarding the support and upgrades after one year, you'll be able to renew your multisites subscription in the menu My account>My subscription for around 60% of the initial cost for one more year. Last edit: 2 years 2 months ago by nicolas. Is there an upgrade to MultiSites from Business? There isn't. At least not for now. Are add-on, Hikaserial, Hikasubscription included? No. For now we're still gathering feedbacks on the multisites for HikaShop only. We'll see then if we extend it to other extensions we propose. 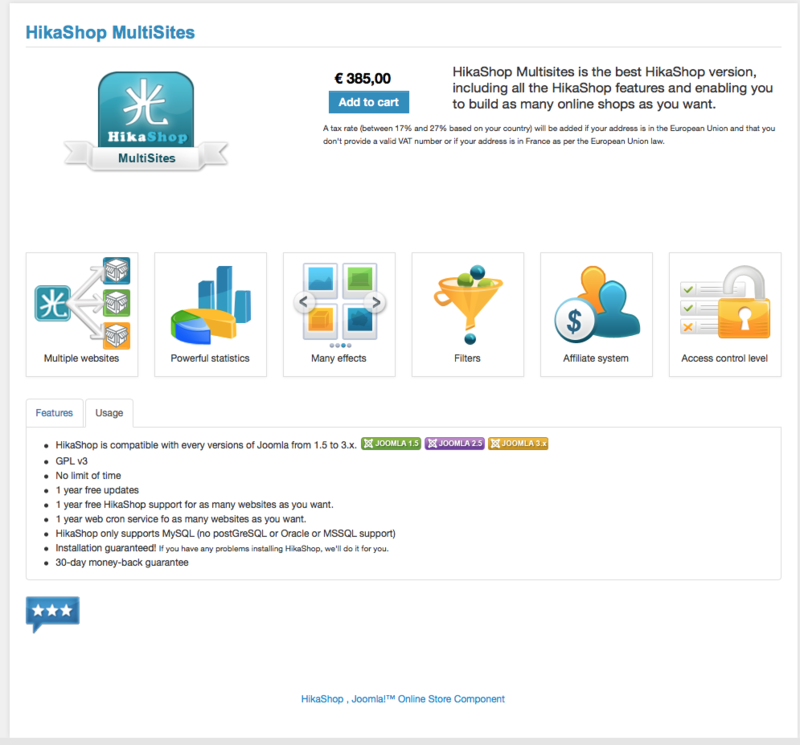 But if you have already more than 3 HikaShop Business editions, it makes sense to purchase the multisites subscription and have as much websites as you want always using the Business edition.